After spending a few days in Sighnaghi, we headed out to Telavi, stopping along the way to see various places of interest. 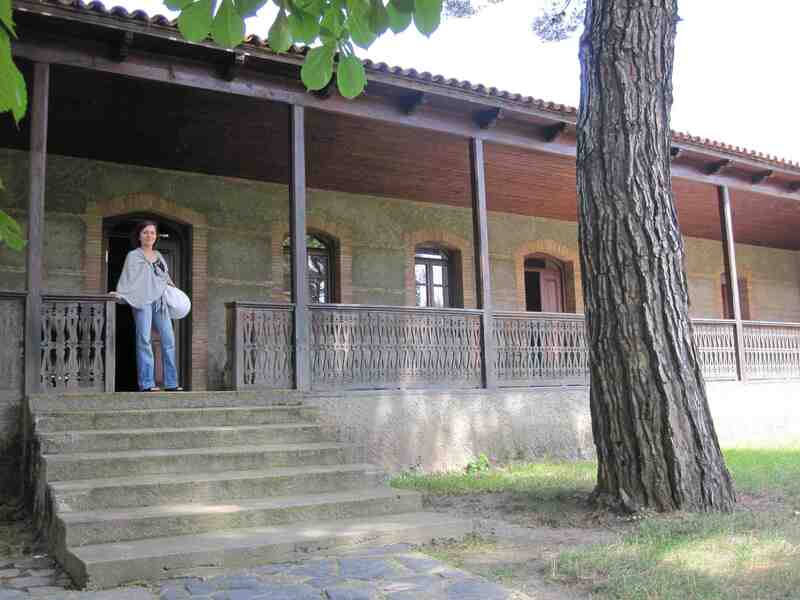 This is in Kvareli, a small town whose principal claim to fame is the house of the “father of modern Georgia” Ilya Chavchavadze, writer, reformer and patriot. From what little I know about him, gleaned mostly from the handful of texts accompanying the pictures and artifacts at the museum that had been translated into English, he seemed to be a sort of Georgian Tolstoy, minus the increasingly bizarre religious bent the latter suffered. Landed gent, educated abroad, idealistic, brilliant, philanthropic, and with a sort of paternalistic concern for the welfare of the serfs mixed with disdain at their boorishness and refusal to be helped. One story relates how he tried to organize the locals, presumably mostly peasants and merchants, in providing a reliable, constant source of water, everybody chipping in to create an equitable system. The peasants grumbled and thundered (submissively) about the impossibility of the thing, its utter unfeasibility, and that they would have no part in such a scheme. Chavchavadze dully went about providing himself with the water, and when the peasants came to him demanding water, that it was his obligation to give them water, complaining about the unfairness that he should have water and not them, he curtly refused. Such events (and an aristocratic fondness for wine and gambling) earned him a somewhat rough reputation among the population at large; he was, however, made a saint of the Georgian Orthodox Church in 1987. 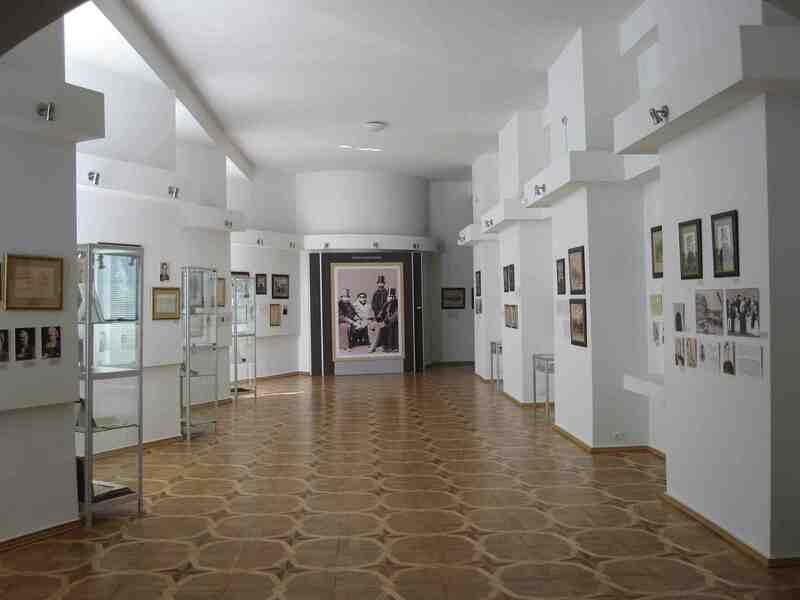 The museum is well worth a visit; lots of pictures and information about his life, his travels, his association with other prominent Georgians, and his connection with events in Europe. He apparently wanted to join Garibaldi in Italy, and though he was eventually unable to, he remained an admirer, translating some of Garibaldi’s works into Georgian. The exhibits are intelligently presented, items well-chosen and well-documented, the two separate floors of material full of interest. Exiting the museum from the back one enters the gardens of Ilya’s house (the museum building is a recent addition), a beautiful, spacious expanse of trees attractively distributed around the grounds, and a number of unusual species of plants carefully cultivated here and there. 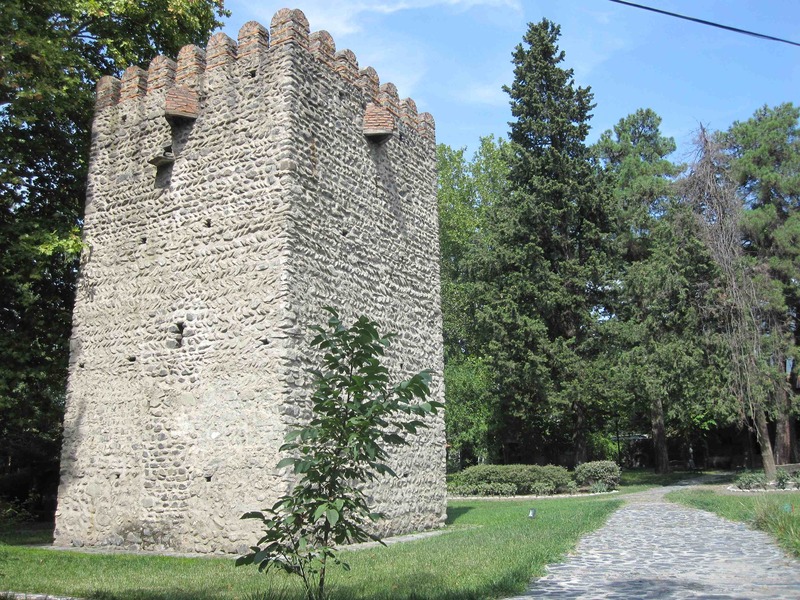 The defensive tower near Chavchavadze's house, where he was born. 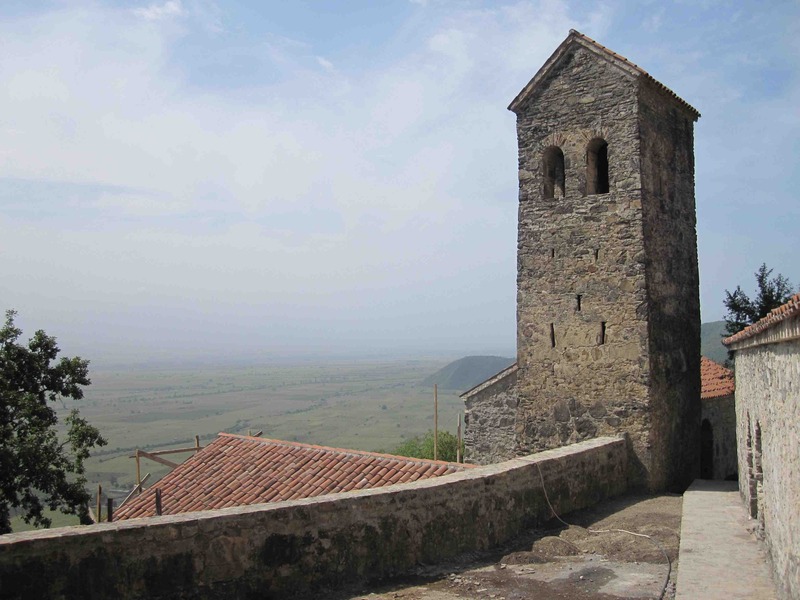 Roughly in the center stands this large defensive tower in which Ilya was born—Lezgins were rampaging through the area at the time and the family retreated to this refuge during the attacks. Kvareli is relatively close to the border of what is now Daghestan, and apparently this was a comparatively frequent occurrence. King Erekle II had two sets of walls built around the town in the 18th century, one inside the other, to provide protection from the marauding tribes, though I didn’t see any remnant of those during our visit. The attractive building on the left is the house proper, a small but elegant place thoughtfully and carefully renovated. 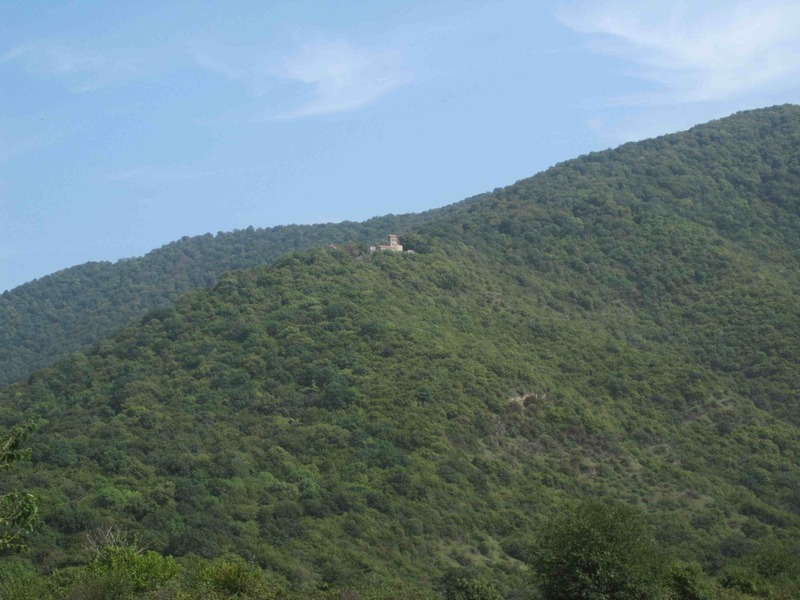 The ivy-covered structure on the right is the marani, the wine cellar. Despite its elegance and comfort, it wasn’t very large; rather confining, one would have thought, for a Prince with such soaring ambitions. 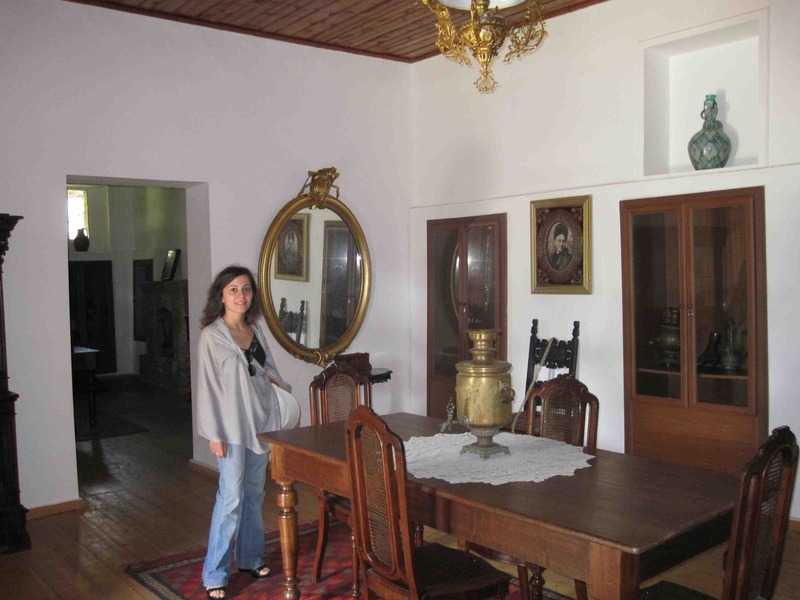 It was basically three rooms, one on either side of this central living room. But a pleasant place. Reading in my guidebook (Lonely Planet) that the marani was “truly impressive”, I was curious to see it, imagining cold, dark, subterranean vaults of old stone with perhaps some aging barrels—or a cask of Amontillado—lining the ancient walls. Instead there was this quite lovely, and large, room at ground level. As I’d seen elsewhere, Georgian urns are like the ancient Greek ones, vast jugs with pointed bottoms that are inserted into the ground with their rims flush with the surface. When the grapes are pressed—in the large tubs visible in the background—the juice is bridged via miniature aquaducts, like wooden drain-pipes cut in half, into the mouths of the urns, which are then closed with heavy granite tops and covered with earth to ensure that they’re airtight. After an appropriate period of time, one dipped a long ladle into the urn and extract the wine. The mill-house, fed by a narrow irrigation channel-like stream. 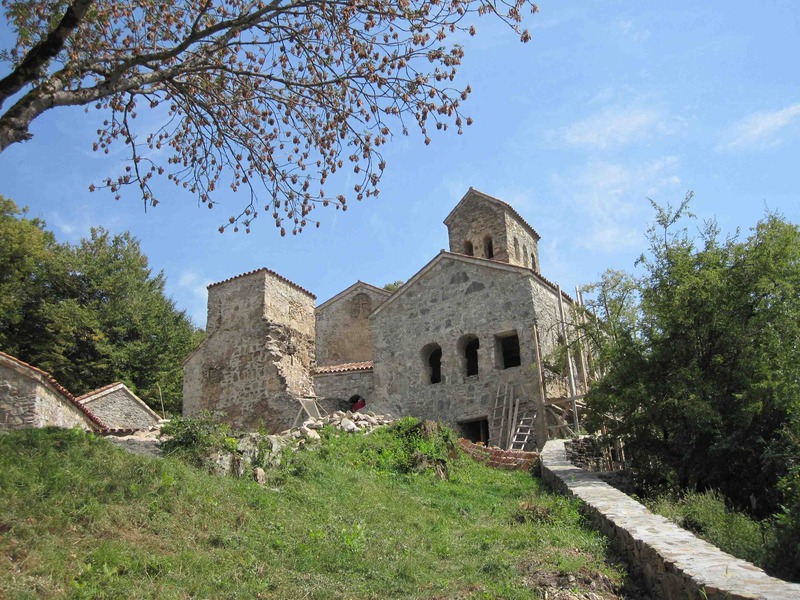 We got back into our taxi and headed for the next stop, the Nekresi Monastery a short drive away. Perched on the top of a hill overlooking the Alazani valley, one is forced—unless one arrives in a rugged jeep or truck of some kind—to climb the kilometer and a half up the hill by foot since the road is in such terrible condition. There’s also, I noticed, no space for parking up at the top. Somehow in this picture the road doesn’t look as steep and decrepit as I remember it being on my way up…. 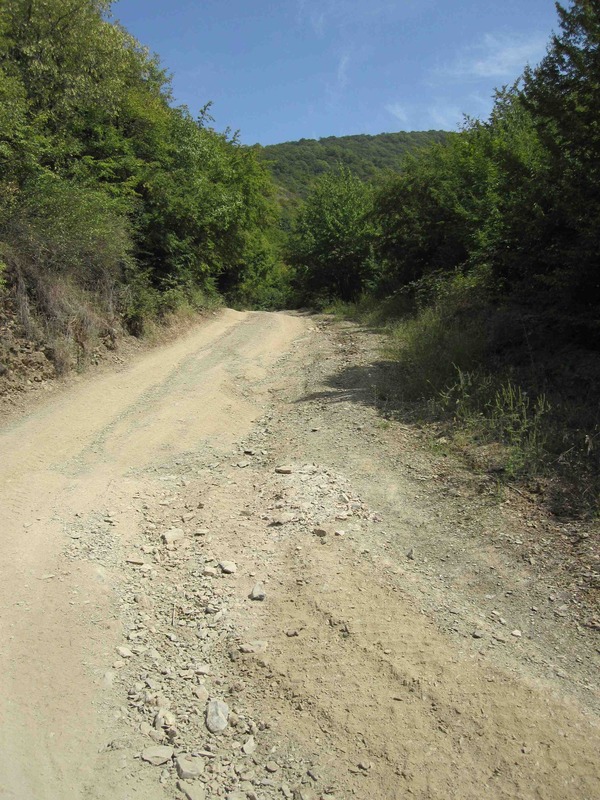 In any case, Khatuna, having been to the monastery before, gave up about half a kilometer up, and sat resting on a large stone in the shade by the side of the road, and I marched up alone. The smaller church, one of three. 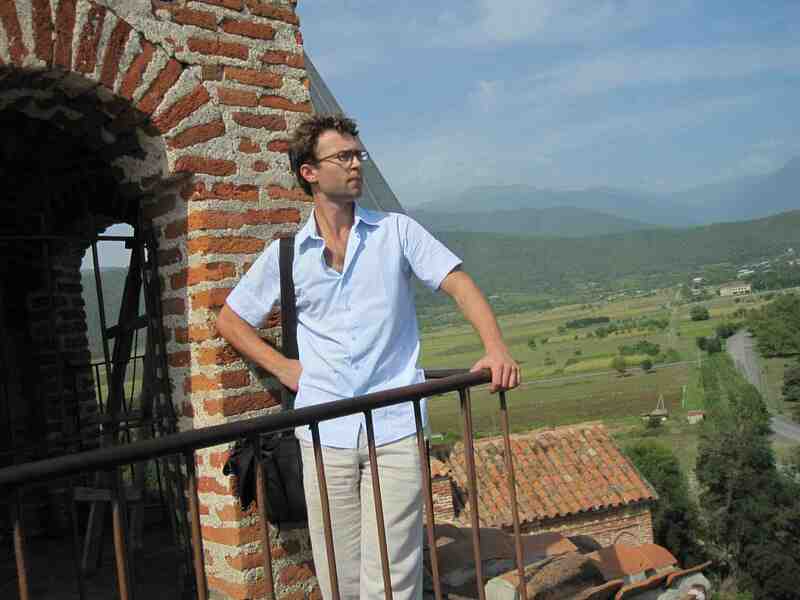 I finally arrived at the top, and found that the whole place was being extensively renovated: scaffolding on most of the buildings, large piles of building debris and timber and earth scattered about the place. I must have arrived just after lunch, since the 25 or so workers I saw were all sleeping—on planks of wood, in doorways, in the shadows under the eaves, inside the half-finished buildings. So I walked around quietly and checked the place out—other than the resting workers, I had the place completely to myself: no priests or attendants or other tourists. 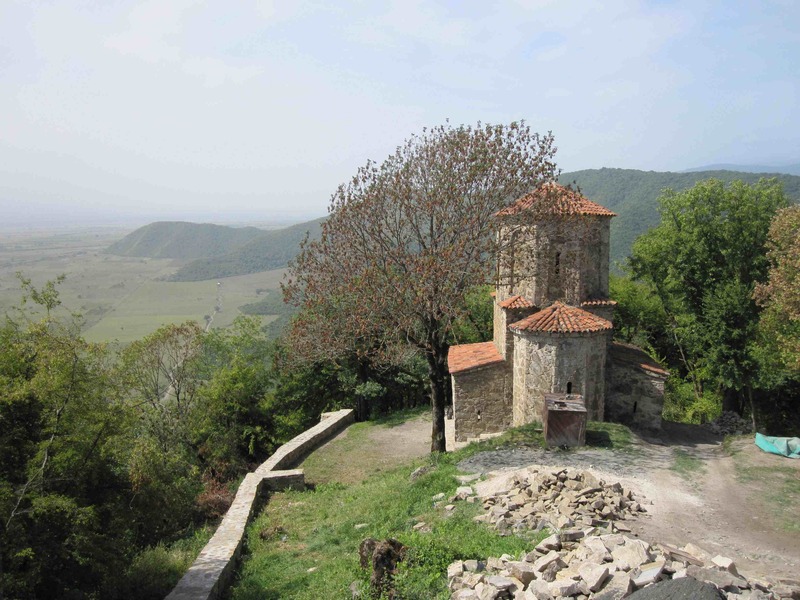 Apparently one of the first Georgian churches was built here in the 4th century, and in the 6th century one of the 13 Syrian Fathers (one hears much of their exploits around religious centers in Georgia) founded a monastery here. 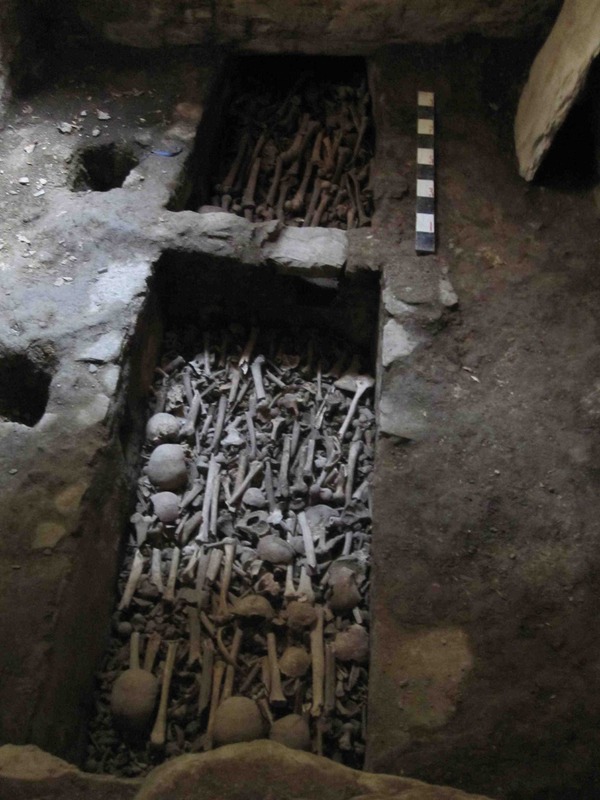 This particular Syrian Father, Abibos, reportedly converted many of the highland Georgians, and was killed after he poured water on a Zoroastrian sacred fire. He paid for it, but the man had style. 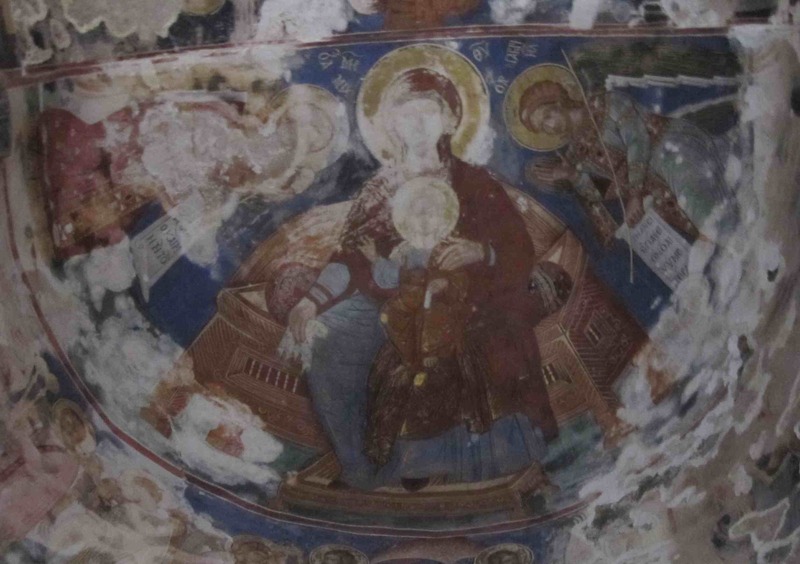 Most of the frescoes and murals are reportedly 17th century. I tried to read the inscription on the scrolls on either side of Mary’s throne, but, even zooming in, I couldn’t even decipher whether the letters were Greek, Cyrillic, or Latin. Pretty sure they’re not Georgian, though. 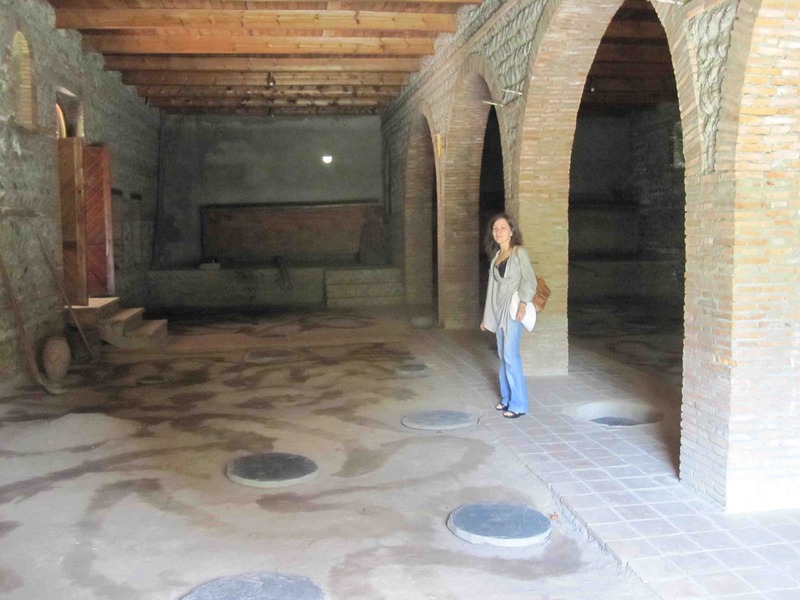 I was amused to see that Orthodox monasteries were as fond of wine as their Catholic counterparts were—every monastery or church complex invariably had their own marani. It was quite beautiful, and it’ll no doubt be lovely when it’s all finished. The workmanship—at least from what I could see—was careful, attractively done, and in character with the place; it’s a shame that Georgians only do this kind of thing with ecclesiastical buildings or huge government projects like Sighnaghi. One can’t help thinking that moral—also tourism—would be boosted by towns that were both better built and less grievously unattractive. 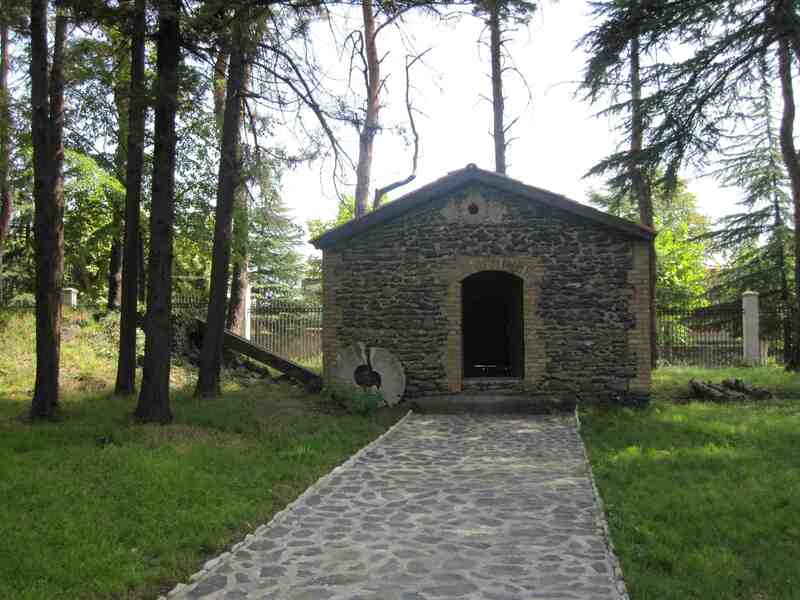 The renovations in the little chapel. Khatuna had explained to me in the taxi on the way over that a famous saint (was it Abibos himself?) 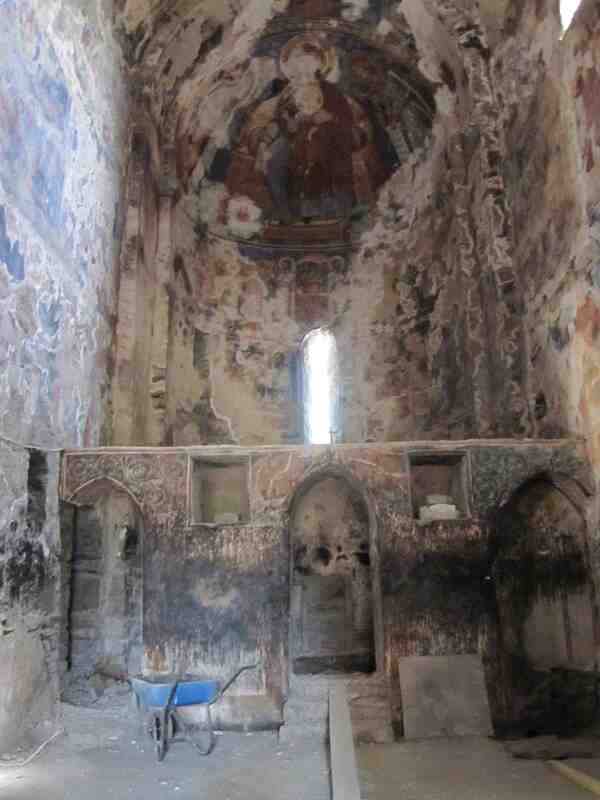 is buried in Nekresi, in a little chapel facing the principal church. Stories abound regarding the power the site has: healings and prayers answered when addressed to the saint from inside the chapel. So I was curious to see it. When I got there, I found it in the middle of fierce renovation, the walls more or less completely scraped off, the space littered with building materials and…this little hole in the ground. 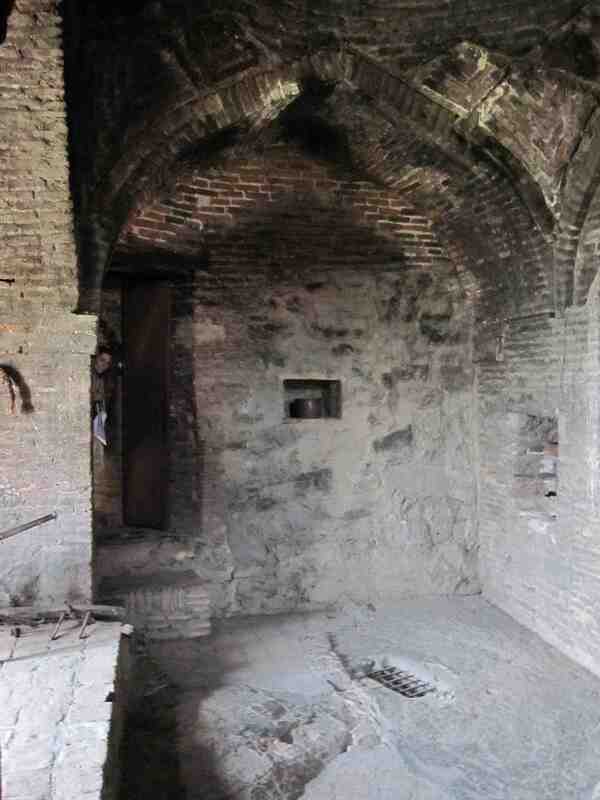 There was no sight of a tomb or any plaques or inscriptions on the walls, so I took a peek downstairs. The view over the Alazani valley. A beautiful place, and will no doubt be even more beautiful once all the renovation is finished. I looked around for a while and then trotted back down the hill, found Khatuna, and went back to the taxi. 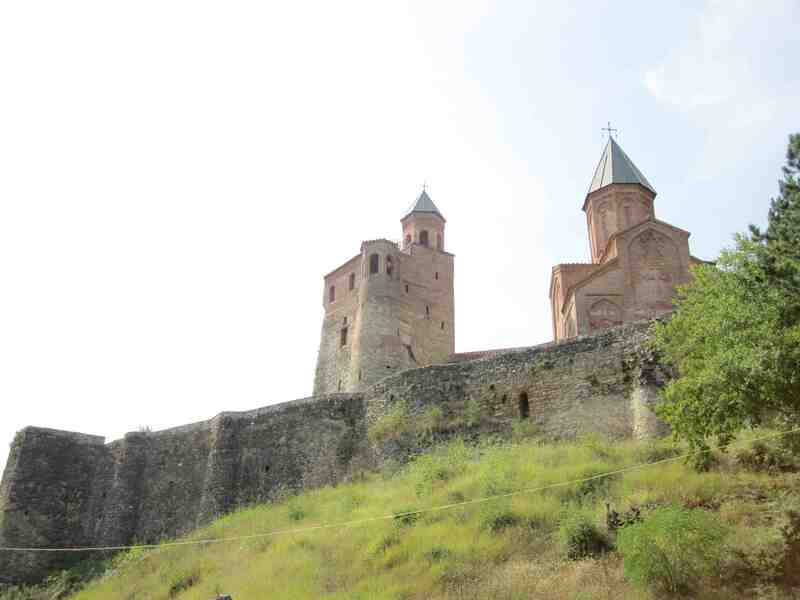 Our last stop before reaching Telavi was Gremi, a rather non-descript town but with this marvelous citadel still intact. 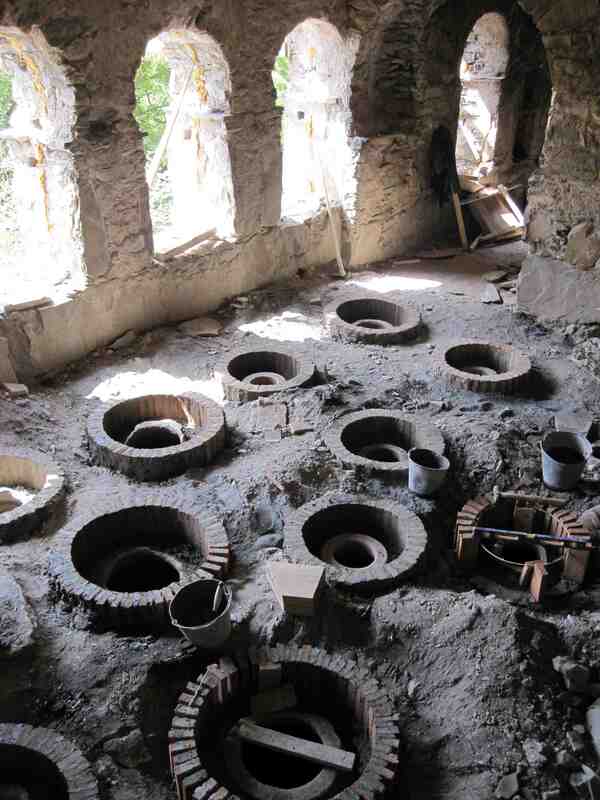 Gremi was the capital of Kakheti from 1466 to 1672, but all that remains besides the citadel are ruins of the market, baths, and caravanserai. The entrance to the museum is in the narrow passage to the left. 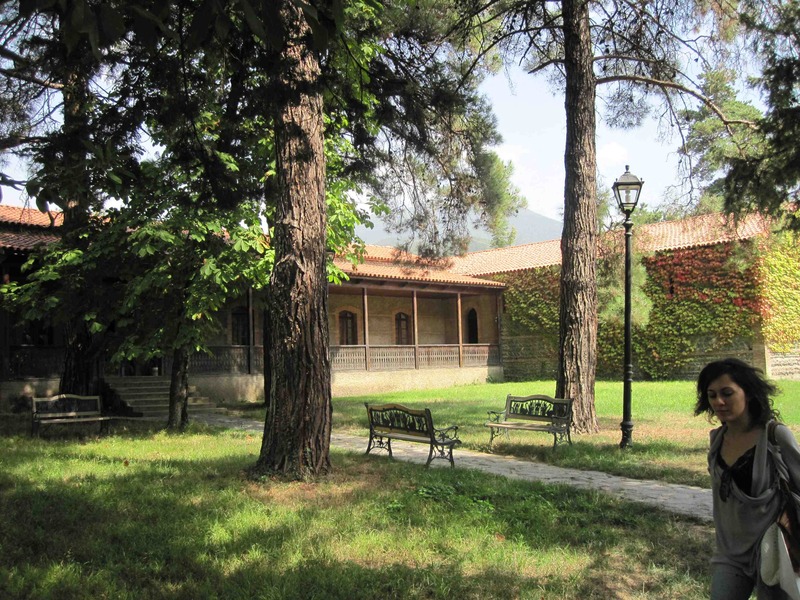 The museum houses a number of artifacts, from bronze-age jewelry and tools through medieval farming equipment and castle tools to early modern weaponry. 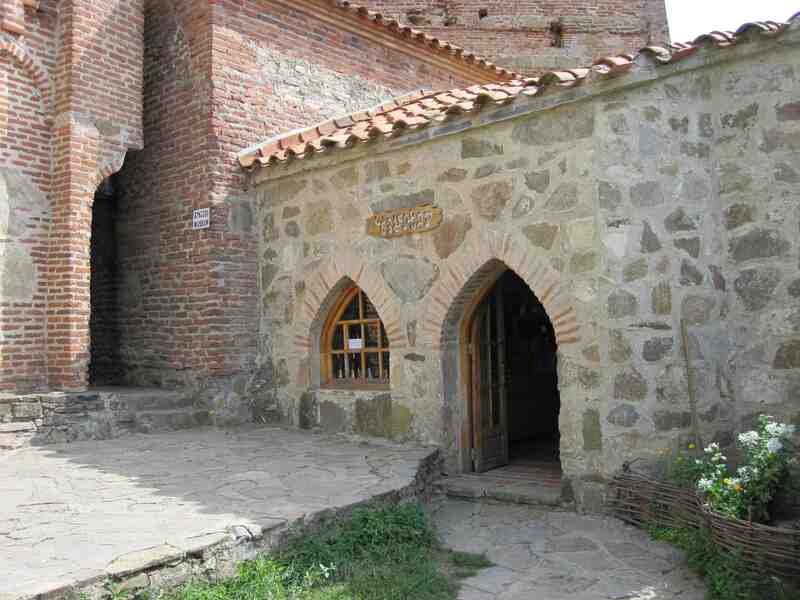 The castle had three floors, reached by steep winding staircases. 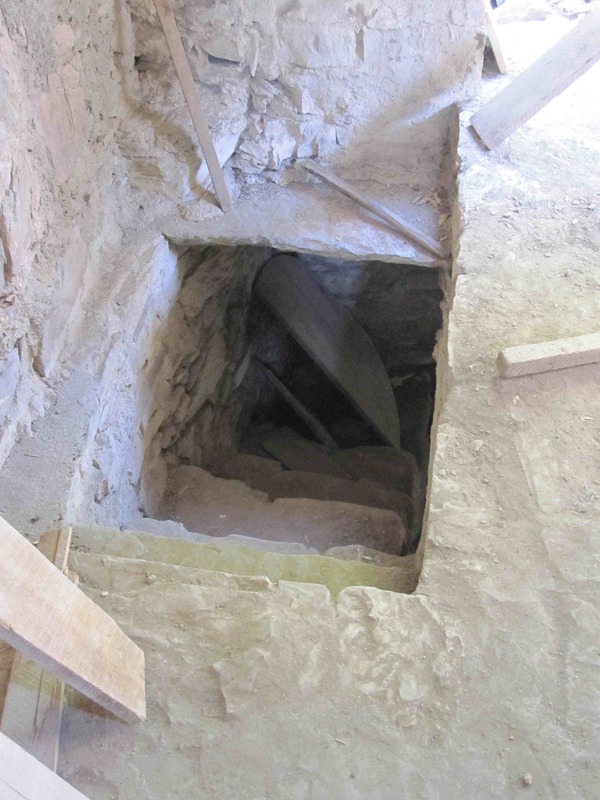 In the center of the floors on each of the second and third levels there was a hole of about a square foot crossed with iron bars, in this way connecting the top chamber with the hall at the bottom. The guide explained that this was so that the king could shout down instructions without the servants having to march up to hear his request, shuffle back down to execute the order, and then climb up once again with his delivery. 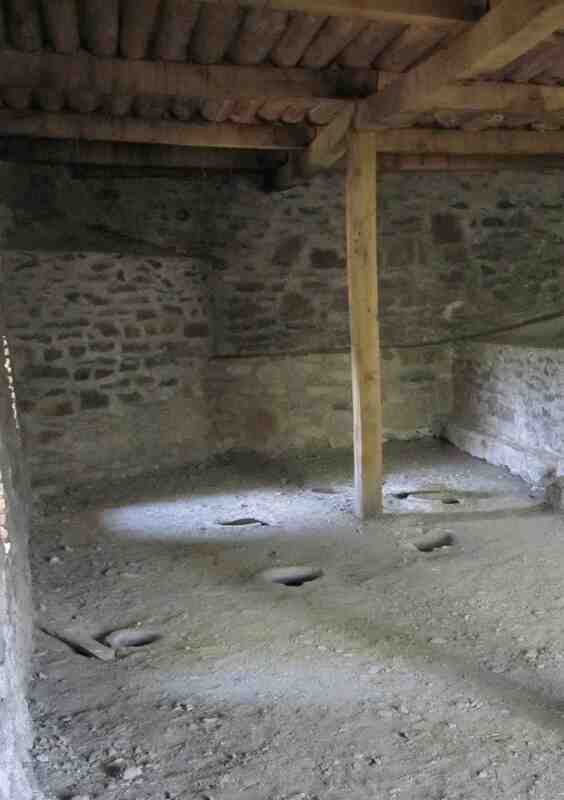 This is the first floor chamber, with its grated hole in the floor. The guide was a tall, robust fellow with a large round head and large, meaty features. He looked a bit out of place there, like a middle-aged rugby player guiding groups around Warwick Castle, but he was knowledgeable about the exhibits and the area. Initially his explanations were rather perfunctory, pointing to an artifact and rattling off a few sentences that seemed well-rehearsed; but gradually he thawed, and his enthusiasm ignited, descriptions and anecdotes pouring out so quickly Khatuna could only translate a few for me. At the end of the tour he asked where I was from, and became quite animated on learning I was from Italy. Talk turned immediately to the football match a few days previously, a flow of expostulations and expressions and gestures and head-shakings. A younger colleague drifted towards us, and we discussed the match for a little while before leaving the museum. 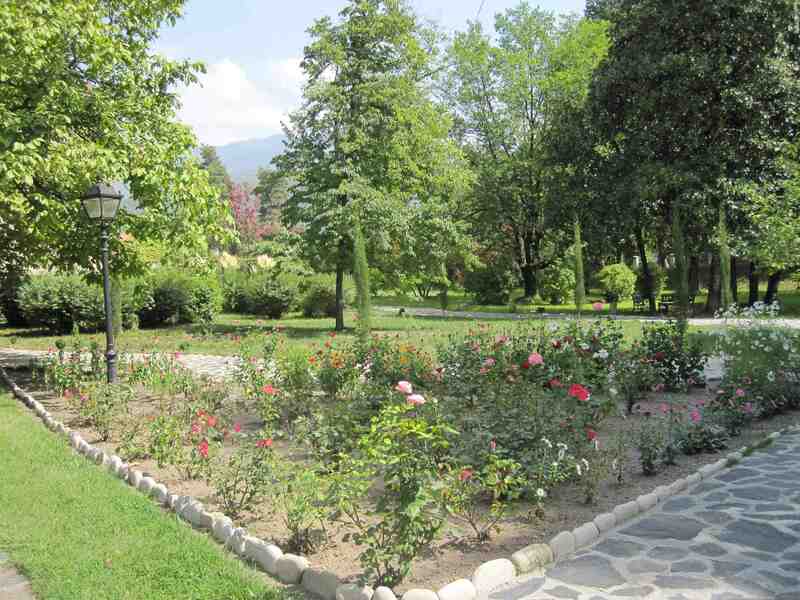 In the grounds between the castle and the walls was the marani. Oddly, there were also the gaping mouths of the urns outside the marani proper, in the grounds along the walls. 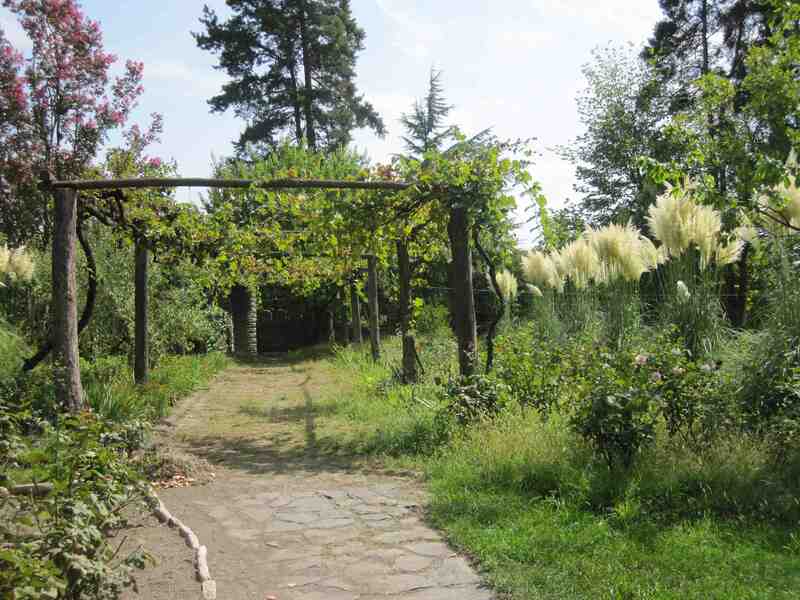 From Gremi we drove to Telavi, arriving in the late afternoon. I know I’m a bit late in responding to this … but, thank you for the fine pictures and descriptions of these old monestaries. The stone work is quite amazing !! Thanks Ed. Yes, it’s quite beautiful, and thankfully they seem to be doing a decent job in renovating these old buildings. I find the similarity with Celtic (Viking?) in decorative motifs intriguing, and can’t figure out if it’s coincidental, independently developed or brought from some intrepid stone-masons… Thanks for stopping by!